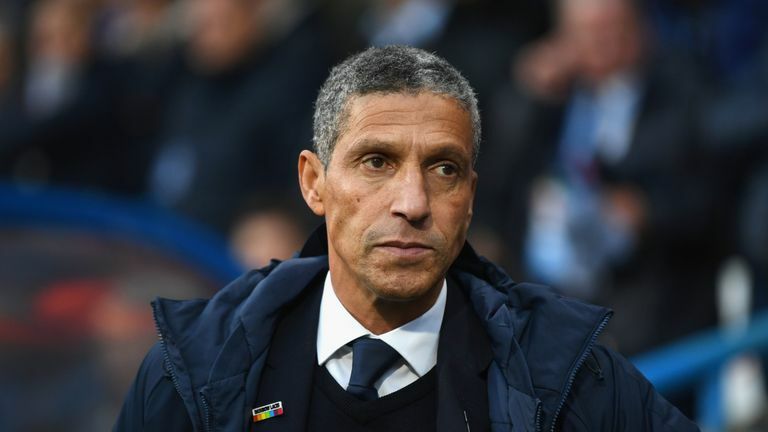 Brighton boss Chris Hughton has called on football's decision-makers to ensure another generation of talented BAME coaches is not lost to the game. Despite black footballers representing over a quarter of all professional players in England, there are just six BAME managers across the 92 league clubs in England and Wales. Hughton - the longest serving of the six - and Wolves counterpart Nuno Espirito Santo are the only black managers in the top two tiers of English football. "If anything, the influence of black and ethnic players has become more and more [in recent years]," Hughton told Sky Sports News. "To have that incredible imbalance between playing, and coaching and management is something that is not right. "We've lost out on generations of really influential black and ethnic players who could have had real influences. It's only the game that can change that." Brighton also have a black manager - former England boss Hope Powell - in charge of their women's team. Powell has been no stranger to discrimination during her career as a player and a manager but credits educating herself and upskilling as a coach in helping her cope in the face of adversity. "I am two-fold. I am black and I am a female, so I think all my life I have been in environments where of course I have experienced discrimination," she said. "How have I managed that? I do not ever ignore it, I just try and present myself in the best possible way that I can. "In my culture, my mum was all about education. People can't ignore education. It's a way out. It's a way of moving forward and I've always believed in that." Research from the Sports People's Think Tank (2017) highlighted the scale of the inequality on the touchline, revealing only 22 out of 482 senior frontline coaching positions are held by people from the BAME community. Nine of the 22 (41%), are employed at just four clubs - Brighton, Crystal Palace, Reading, and Queens Park Rangers. Brighton chief executive and deputy chairman Paul Barber says he feels a responsibility to ensure BAME coaches feel they have a fair shot at landing a coaching job when an opportunity arises. "I grew up in a very ethnically diverse area of north London and I didn't really see or notice people's different skin colours or religions at that time," he said. "We're trying to hire the best coaches for the job. You don't stay in the Premier League or the Women's Super League by not having the best possible coaches or the best possible candidates. "Therefore, all we are looking to do is to make sure there are no barriers, to make sure everyone feels like they can apply for roles here, everyone feels they can get a fair interview, and everyone feels that if they are the best person for the job, they will be hired."